The village of Grézels is situated near Prayssac, between Cahors and Puy l’ évêque. Around the Saint-Hilaire church remain houses from the 15 th and 16 th centuries. The impressive “Château de la Coste”, conceived as a fortress, attracts attention. Built by the bishops of Cahors in the 13th century, today it shelters a wine museum. The Lot département, is the land of the “bastides” (walled-in villages), the castles, the pigeonries (pigeon-towers). The Lot is of course a very delicious region thanks to its gastronomic richness and diversity, just like in the land of plenty. Here you can taste plums, nuts, foie gras (goose liver), truffles, goat cheese …. all accompanied by Cahors wines. 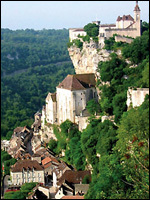 Rocamadour - the abyss of Padirac - St.-Cirq Lapopie – Cahors – the Castles of Fumel, Bonaguil and Assier – the caves of Pech Merle, Lacave, Presque and Cougnac, ..., Puy l’ évêque and a lot of other villages are worth being visited…..